This year marks the fifth year of our signature Layflat Notebook. ola’s journey began six years ago with the development and creation of the Layflat Notebook. Not satisfied with the notebooks she could find on offer, ola’s founder Katy set about reimagining one of her favourite and most used everyday items. The aim was to create a notebook that was not only beautiful, but also a joy to use. After months of research she finally identified a style of binding that would enable a notebook to lie flat, something she felt was essential when sketching or note-taking. With no manufacturers offering this style in the UK, Katy set about tracking down a company who had the equipment and expertise to bring the Layflat Notebook to life. 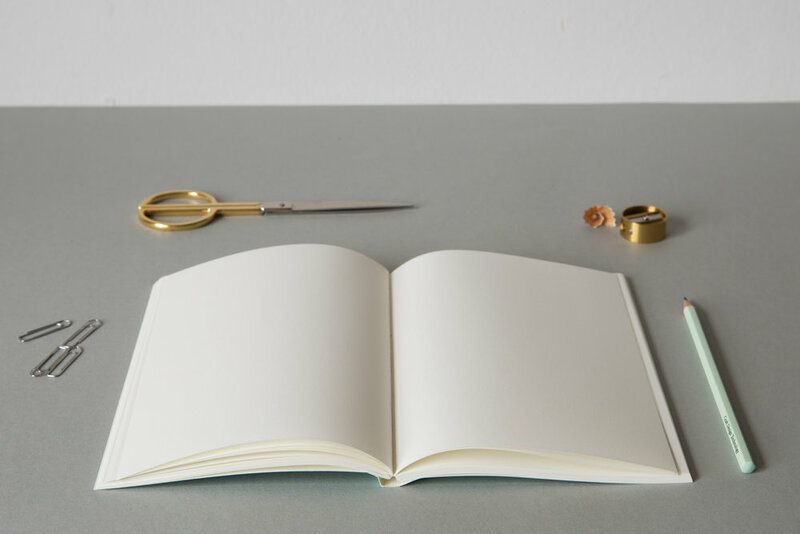 Approaching a family run UK bindery who specialise in making music textbooks, together they worked hand in hand to develop what we now know as the Layflat Notebook. From the 300gsm embossed paper cover, printed with vegetable based inks, to the traditionally sewn binding that allows you to work across two pages simultaneously. It took a year of designing, exploring and testing bindings and materials before we landed on the perfect process and papers. In celebration of the Layflat Notebook’s fifth year we launch our new Everyday Objects collection. The range reimagines some of our favourite everyday items, honouring the form and functionality behind each design.